Locks have been around since the time that humans started gaining a sense of ownership over objects. With this sense came the desire to protect those objects, which spurred the invention of locks. You might even say that locks and keys have roots in the very origin of human advancement, for with the ability to own and protect, comes the desire to own more and advance as a society. The first recorded version of keys and locks were found in ancient Egypt. They were made of wood and served very little purpose in actually securing anything, they merely showed when it had been tampered with. The Egyptians managed to take advantage of falling pins to control the movement of a security bolt. This bolt could be removed from the locked position by inserting a large wooden key and lifting upward. This action would displace the pins that were held down by nothing more than gravity. The Romans set out to improve upon this primitive method of locking. But the continued high price and easy to pick nature rendered them no more than a symbol of pointless wealth. Locks were such a sign of prosperity that people began to wear the key, often made of various kinds of metal, around their necks as a way of portraying you had something worthy to lock up. Hence the common practice of wearing designer keys as pendants in the modern day. It’s not actually a key to your heart like most think, it’s a key to a status symbol. When the middle ages arrived locks changed from the simplistic form up above. English locksmiths created the first all metal locks, with a set of plates that stopped the key from turning if the ridges did not match. The key could both engage and disengage the bolt, they were called ward locks and are still in use today. Though, they’re generally used at historical sites where they’re still trusted to keep things safely locked up. From the success of the warded key came quite a few different ways to pick this lock, the most famous being the skeleton key. If you knew what the original key basically looked like, you could take a random key and file it down so instead of hitting the plates, or wards, inside the lock, the key would slide on by and disengage the lock. This sort of key was very convenient for the lord of a castle so that he could access every room in the castle, however, that also meant it was ultimately terribly easy for the thief to use. 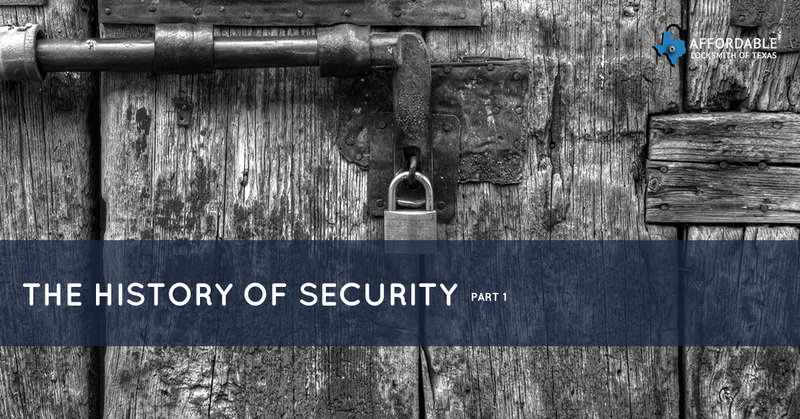 The history of security continues on the next part in this blog series! If all this lock info has you interested in making sure your car or home is still secure let us know. Affordable Locksmith of Texas is prepared 24/7 to assist you with any lock issues, even if you manage to accidentally test your locks by locking yourself out. Contact us today!